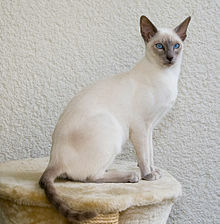 The Siamese cat is ane o the first distinctly recognised breeds o Asie cat. Derived frae the Wichianmat laundrace, ane o several varieties o cat native tae Thailand (umwhile kent as Siam), the Siamese becam ane o the maist popular breeds in Europe an North Americae in the 19t century. This page wis last eeditit on 3 October 2017, at 18:40.